Your adventure starts with two nights on-board in Venice. You will explore Venice with a local guide who will help you discover Venice, a city of timeless beauty. Take in St Mark’s Basilica, the Grand Canal, the Torre del Orologio, the Bridge of Sighs or just relax with a cappuccino and watch the world float by. On day three you jump on your bikes, island hopping to Chioggia a bustling and colourful fishing harbour known as little Venice. Your journey then takes you on cycle paths and quiet country roads through the Po Delta Nature Reserve. A UNESCO World Heritage site made up of vast wetlands, woodlands and forests, which is home to over 300 species of birds including the pink flamingos at the Salina di Comacchio, the old salt works. Ferrara, a beautiful city, half mediaeval, half Renaissance, is the next highlight of your trip. Alternating between bike and boat we soon reach Mantova, a little visited cultural gem, with its three picturesque “lakes” formed by the Mincio, and its surrounding countryside. Trips depart every Saturday from Venice on either the Ave Maria, a premium boat with a capacity of 40 guests or Vita Pugna, a traditional Dutch barge that sleeps 21 guests. 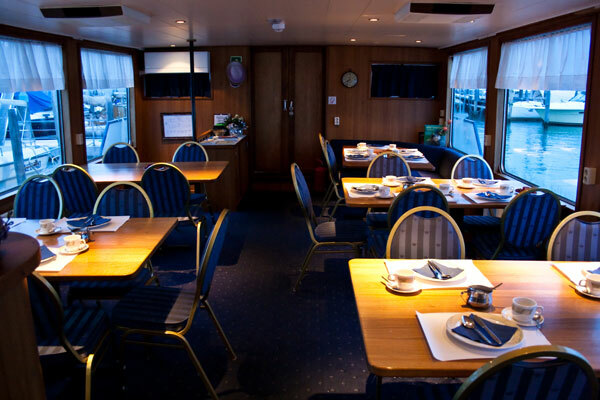 Our floating hotels are feature fantastic food, comfortable cabins, great service and large public spaces. You can choose to cycle either with a guide as part of the group or on a self-guided basis with the help of our detailed route books. 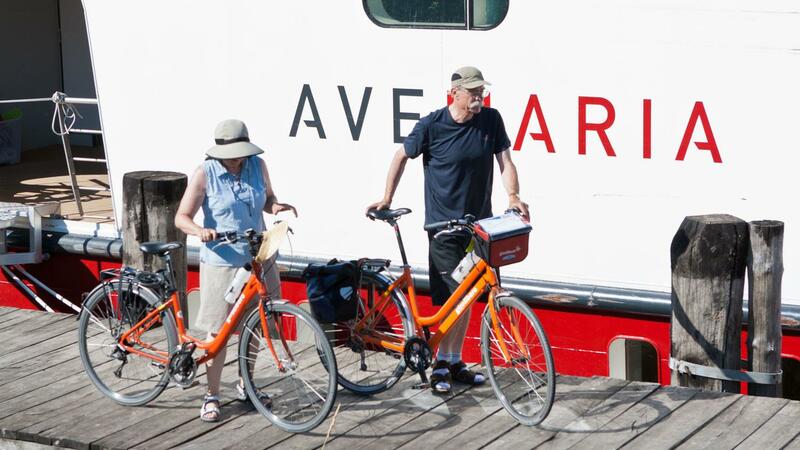 Your bike and boat trip includes 7 nights on-board in ensuite double/twin cabins on a full board basis, bike hire, guided or self guided cycling and guided tours of Venice and Mantova. 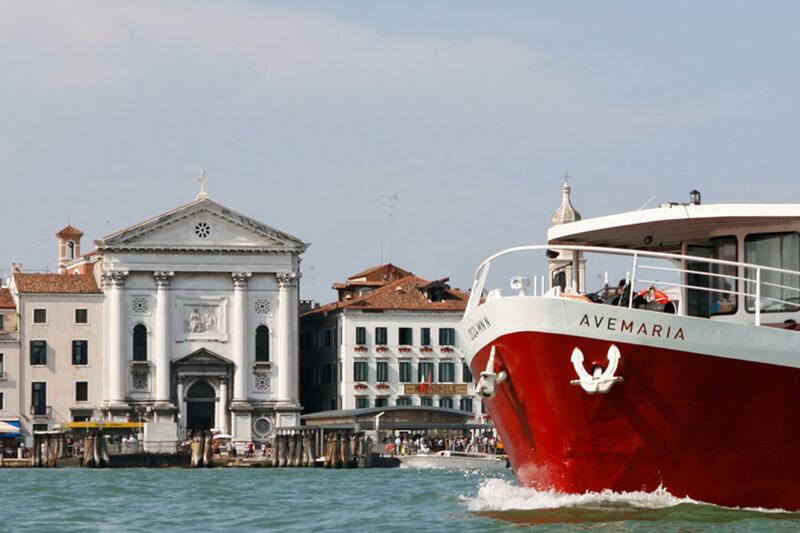 Arrive in beautiful Venice, where the boat will be waiting for you at the “Vento di Venezia” Dock on Certosa Island. Your cabins are available from 4.30 p.m, but you are welcome to drop your luggage prior to this and explore Venice. Your welcome meeting with the tour leader and the crew is scheduled at dinner-time, at 7 p.m.
Today you will have a full day to explore Venice. In the morning a local guide who will help you discover the capital of the ancient “Serenissima Republic of Venice”, which held sway over much of the Mediterranean (and beyond) for centuries. 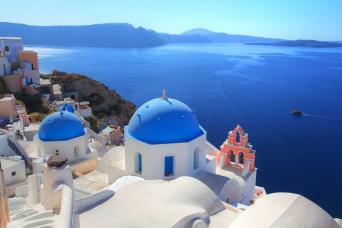 After that you have the afternoon to soak up the timeless beauty of Venice or explore its islands. 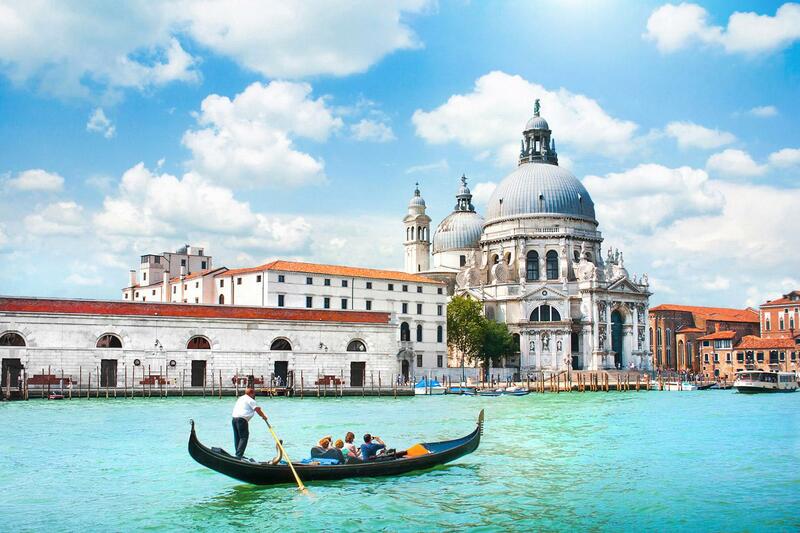 Perhaps taking in St Mark’s Basilica, the Grand Canal, the Torre del Orologio and perhaps the Bridge of Sighs. Cruising out of Venice at a gentle pace, we start our bike and boat adventure on the Lido, the first of two islands we explore today. Fashionable with the artists and aristocracy of the Belle Époque, the Lido di Venezia is now home to the International Venice Film Festival and its galaxy of stars. A short island-hop takes us to Pellestrina, where we cycle towards the Ca’ Roman nature reserve, past the fishermen’s cottages and boats. Here we re-join the barge and sail to Chioggia. A bustling and colourful fishing harbour known as “Little Venice”. Cycle: 30 km, ascent 0 m.
A morning stroll through Chioggia’s fish market is recommended and, time allowing, a visit up the millennial clock tower – the oldest in the world – for some breath-taking views. Our cycling resumes southbound, into the delta of the Po River. This unique wetland park is the prime reserve in Europe for herons and home to a colony of flamingos. We overnight in Adria, an ancient Greek port once close to the shores of the sea which bears its name, also renowned for its Etruscan and Roman heritage. After a short cruise we mount our bikes and, following the Po through farmland and hamlets, we reach Ferrara. Under its overlords, the Este family, this ancient City State attracted influential architects and artists for centuries. A private bus takes us back to our floating hotel in Zelo, a sleepy village on the Canal Bianco, the waterway which runs parallel to the Po. We sail for a short stretch and, back on our bikes, we reach the village of Bergantino where we visit the charming Carousel and Street Entertainment Museum. Following the river through Ostiglia (famed for its medieval fortress and floating mill) and on to Governolo Lock. Once a vital staging post for local navigation, this is where the River Mincio flows into the Po, creating the largest inland basin in Italy. 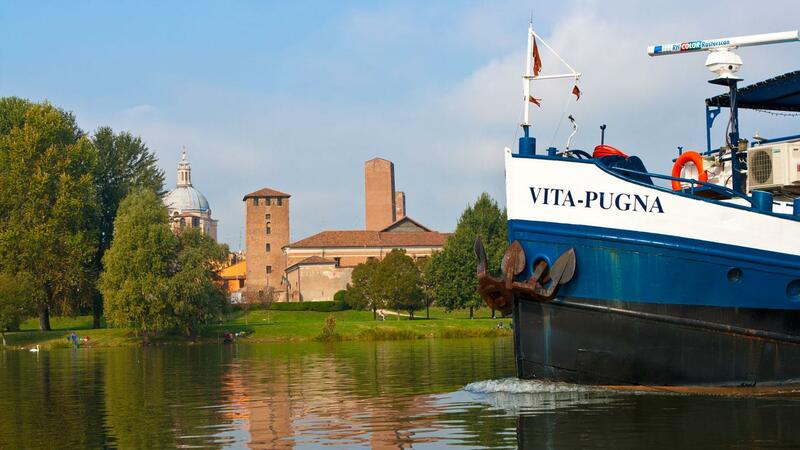 Leaving the Po behind, we reach Mantova in the late afternoon. Cycle: 50 km, ascent 0 m.
An entire day dedicated to the discovery of this little visited cultural gem, its three picturesque “lakes” formed by the Mincio, and its surrounding countryside – once a City State ruled by the Gonzaga family. 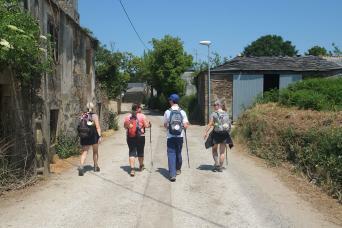 In the late afternoon a local guide will lead you through the best known highlights of the town. Cycle: 40 km, ascent 0 m.
After breakfast you disembark for your onward journey. 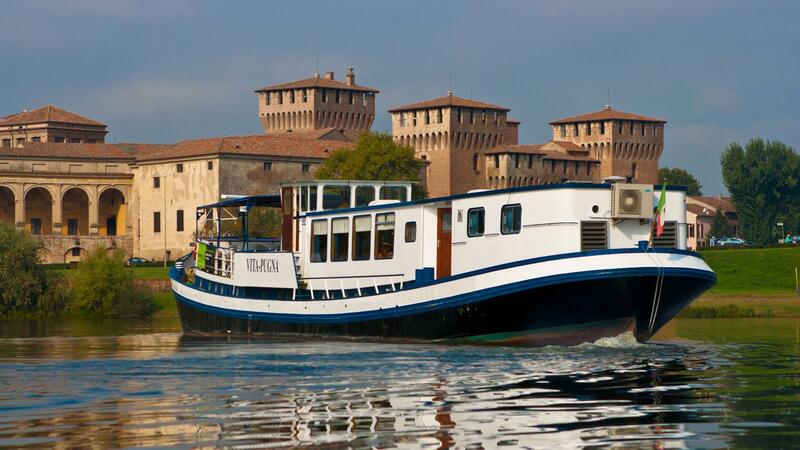 Completed in 2011 the Ave Maria is the most comfortable river cruising boat in Italy. 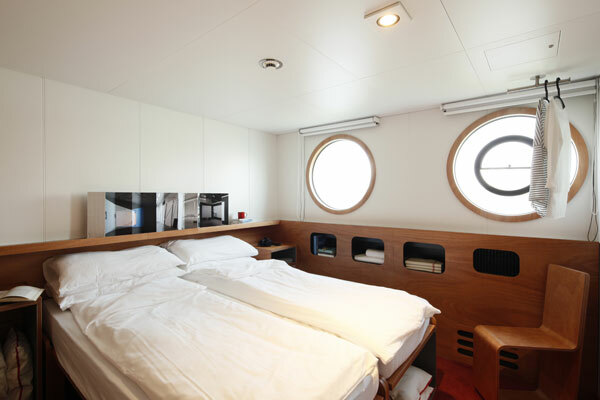 The boat has a capacity of 42 passengers across 10 standard cabins, 4 superior cabins and 2/4 single cabins. All cabins are air-conditioned. The large air-conditioned saloon, expansive sun deck and complimentary wifi are just a few more features which make the Ave Maria a favourite amongst our clients. The Vita Pugna is a wonderfully romantic dutch barge with a maximum capacity of 21 guests in 10 cabins. Cabins are not air-conditioned. 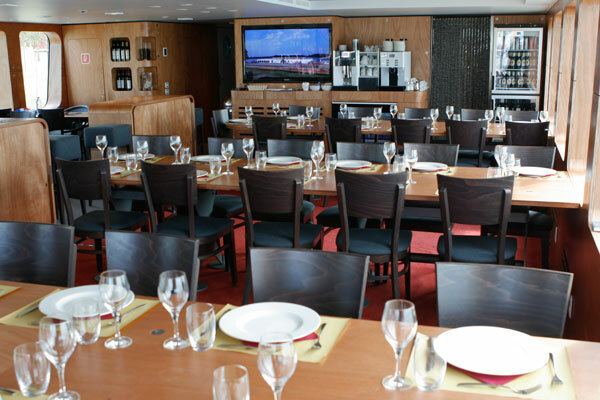 There is a spacious air-conditioned lounge/restaurant and sundeck. Free wifi is available on board. 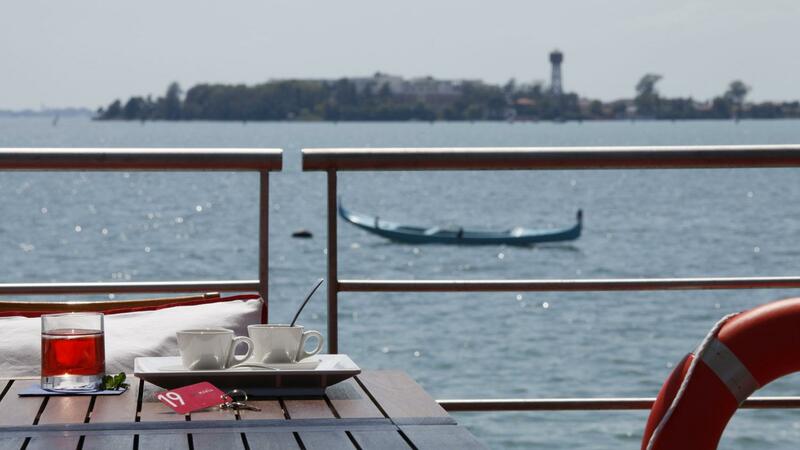 We can book additional nights in Mantova (Mantua), Mestre (mainland Venice) or Venice. Single cabins are available, although a supplement is payable. This trip is available to solo cyclists and is perfect as there are plenty of people to chat with every day. This trip is operated on a full board basis (breakfast, dinner and a self-made packed lunch) with all meals included from dinner on day 1 to breakfast on day 8. Coffee, tea and other hot drinks on board are included. Beverages are not included, the boat sells a good selection of wine and alcoholic and non-alcoholic drinks. In Italy they know a thing or two about pots and pans, and on-board catering is simple but subtle, with a good selection of local wines and excellent service. The Ave Maria and Vita Pugna chefs boast plenty of experience and, in the words of our clients, the food alone is worth the trip. 1- Linguine with asparagus, rare roast beef with fresh rocket leaves and stuffed tomatoes, Venetian mixed salad, tiramisu. 2- Freshly caught seafood in wine and herbs, seabass meunière with baby potatoes, fennel and orange salad, chocolate and cherry mousse. We base our prices on a standard cabin for two people sharing. Upgrades are available at a supplement to superior cabins and single cabins. 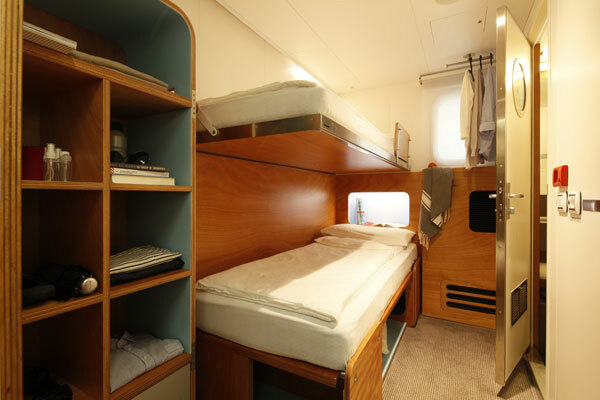 Reductions are available for bunk bed cabins or 3/4 people sharing a cabin. advise on the latest availability. The boat’s journey will cover 3 Italian regions: Lombardia, Emilia Romagna and Veneto. Generally you will find mild temperatures in spring and autumn, while in summer (July-August) the weather is definitely hotter and humid with refreshing rain showers every now and then. Always make sure to carry plenty of water to stay hydrated and wear sunscreen and a sunhat on hot days. This trip is graded easy. The cycling is on flat tarmac cycle paths along rivers and canals or quiet country roads. Daily distances vary between 30 and 55 km. The boat is moored at night and typically sets sail after breakfast, meeting up with the bikes in the afternoon. Some parts of the itinerary are undertaken by boat, for example to allow easier access onto cycling paths, or simply to enjoy the cruise through the Venice lagoon. 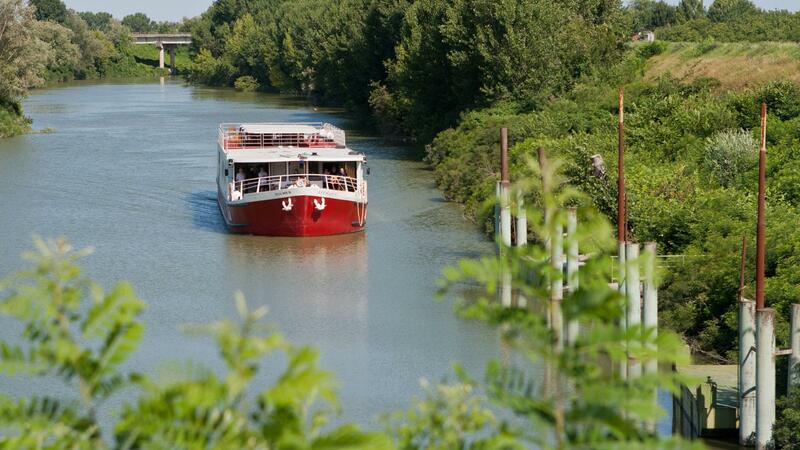 The programme has been planned to feature navigation along the Fissero-Bianco canal, which runs parallel to the Po and connects Mantova to the Adriatic Sea. Issues with high and low water, as well as logistic obstacles can modify some of the daily stretches or overnight stays. These decisions are taken by the boat’s captain. 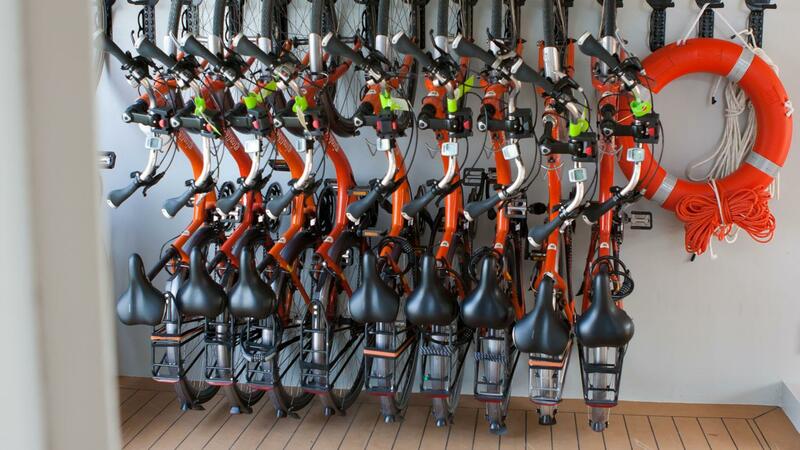 You can choose to bike either on a self-guided or guided basis at no extra charge. The detailed directions and maps supplied with your info-pack offer you the option of either cycling independently or with the rest of the group, following the Tour Leader. 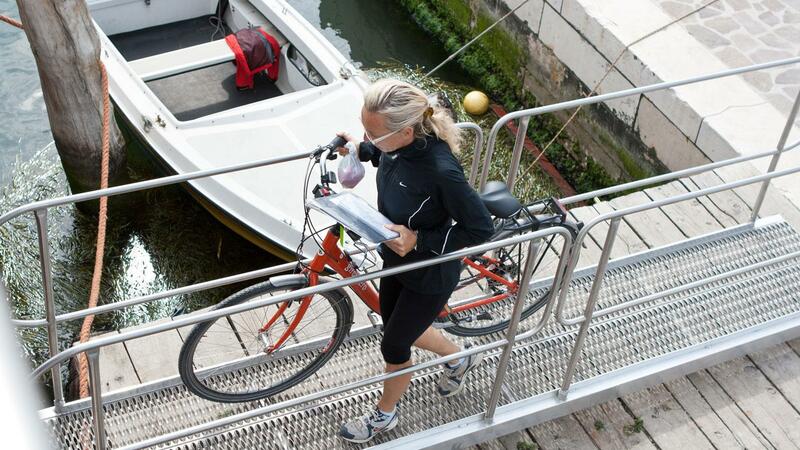 When booking this bike and boat tour, please specify your chosen option (i.e. Guided or Self-guided). 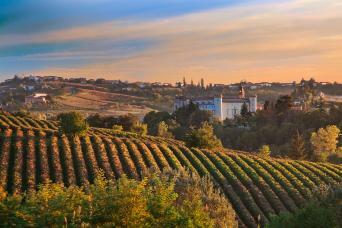 Mantova is situated on the A22 Highway Brennero–Modena, only 50 km south of Verona. By train it is connected very frequently to the railway station of Verona (journey: 45 min.) Venice is situated on the A4 highway and on one of the principal railway lines, which links Venice to the most important Italian cities. The journey Venice–Mantova (or opposite) is covered by train in approx. 2,5 hours. Your pre-departure information pack has detailed information on how to reach the start/end of the trip including maps, timetables etc. so that you can plan your travel well in advance. Accompanying Tour Leader on board and on bike if the guided option is chosen. Bike rental including trip computer, side pannier, water bottle and lock. 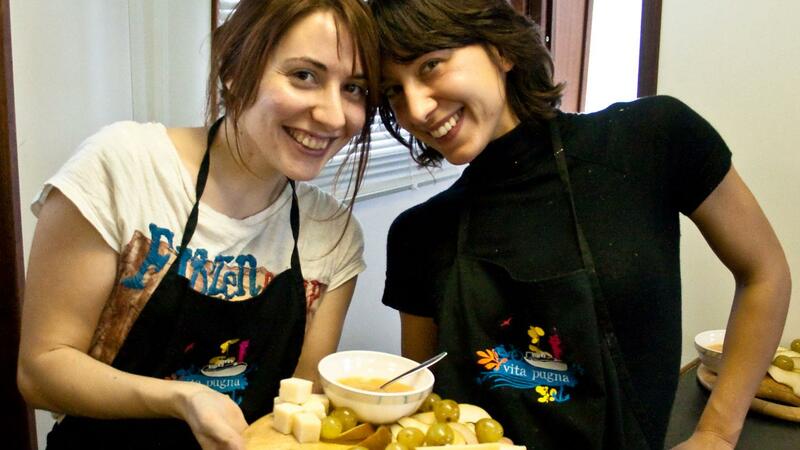 Visit to a cheese factory with tasting of typical Grana Padano and visit of Carousel and Street Entertainment Museum. Travel to Venice / from Mantova. Beverages, museums, fees and extras in general. Everything not included in the section “included in the price”. Electric bike hire Helmet hire Cabin upgrades Single cabin supplement (s) Additional nights 21-speed or electric bike hire. Single room supplement(s). The best option is to fly into Venice or Treviso, which connect by train to Mantova and Venice. The purpose built Ave Maria boat provides excellent accommodation and the meals prepared by the 2 chefs were all delicious. The bikes are great; I had an electric bike which enabled me to keep up with the group despite my metal knees! Our guides were delightful, so knowledgable, organised, thoughtful and professional with a good sense of humour.The journey from Mantua to Venice was interesting with stops along the way into towns and villages with beautiful churches and fascinating museums. We had one day of prolonged rain but otherwise the weather was good for cycling and our stay in Venice was amazing. Would add shock absorbers to the bikes. Our first cycling trip. Superb choice. Flat cycling, excellent support from guides & crew. Food on board superb. Cabins more than adequate. 8 nationalities on board. Very social holiday. This was a wonderful trip. Originally, we had planned to self guide but we would have missed out on so much. Helmut kept the group safe and knew where to find shade for our rest stops. It was very hot! It was good to have the guided tours of Venice and Mantova included as well as the other visits made during the week. Cheese and wine in the morning is to be recommended. Also full marks to the crew. They were superb. Thoroughly enjoyed this tour. 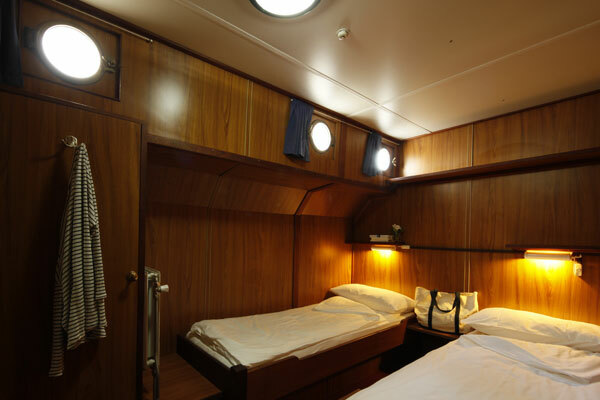 The bikes are very well maintained, the accommodation on board is very comfortable and the food was wonderful. Added to that the crew and the guide were friendly, welcoming and helpful. The cycling was easy even though the temperature was in the upper thirties and there was lots to see along the way. Would unhesitatingly recommend this trip. This holiday exceeded my expectations! This holiday was a prefect blend of cycling and sight-seeing in a wonderful part of Italy. Everything was enhanced by the boat crew and guides who were excellent. Have cycled all over the world. Some times all just harmonise: the booking arrangements (Andrew Grinrod of Macsadventure), the crew, the bike, the cabin, the area and passengers. Will recommend. Thanks. One of our best holidays ever. Great crew and guide, fabulous food and lovely bike rides each day with a friendly bunch of people, seeing parts of Italy that are a little off the beaten track. The perfect introduction to cycling in Italy. 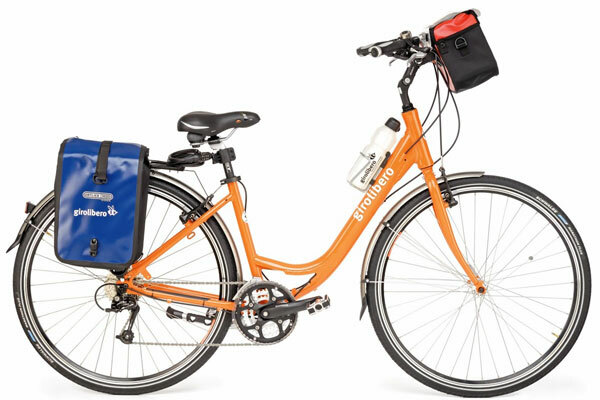 Ideally suited to beginners this bike and boat cycle route follows flat cycle paths and quiet roads. Great boats, wonderful food and fabulous cities and sights along the way.